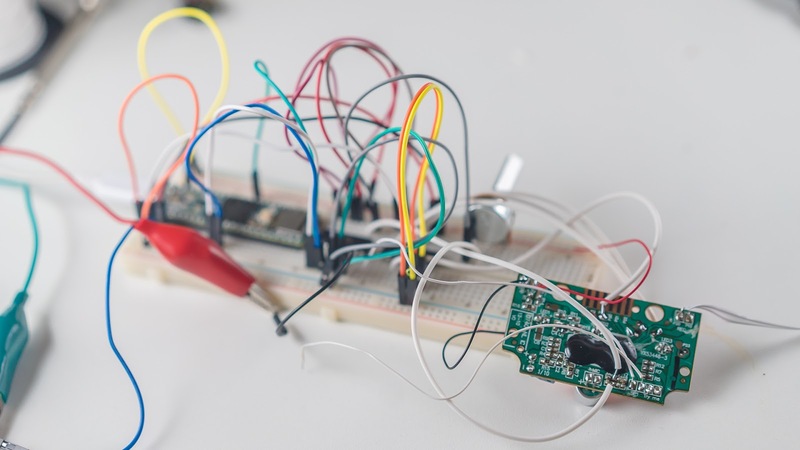 There are many ways in which to interface a toy with an electronic system. What types of control does the toy have? With what can these types of control be replaced? To what should the replacement of control be mapped? 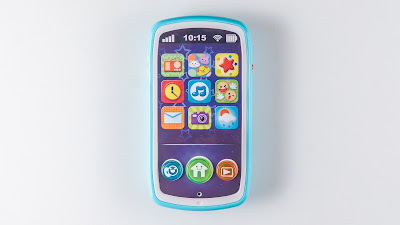 For example, take a simple button on a toy. This can be replaced with a relay, 40106-based oscillator, 4066 switch IC, 4051 multiplexer IC, digital switching mechanism, mercury tilt switch, magnetic switch, mechanical switch. 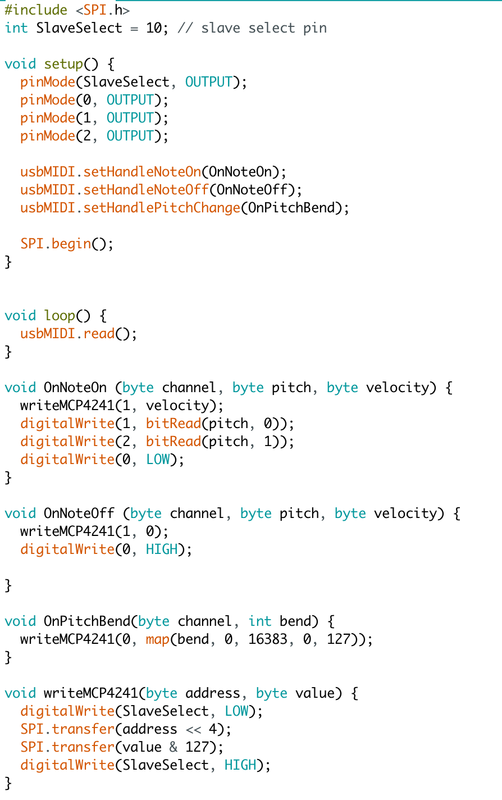 This can be mapped from the physical world (tilting, magnetism), analog electronics (using the resistance of a pot of a 40106 oscillator to set the triggering speed), MIDI (note on, note off, CC, pitch bend etc), serial (on / off), ethernet etc. Let's examine an specific example of implementing this process. 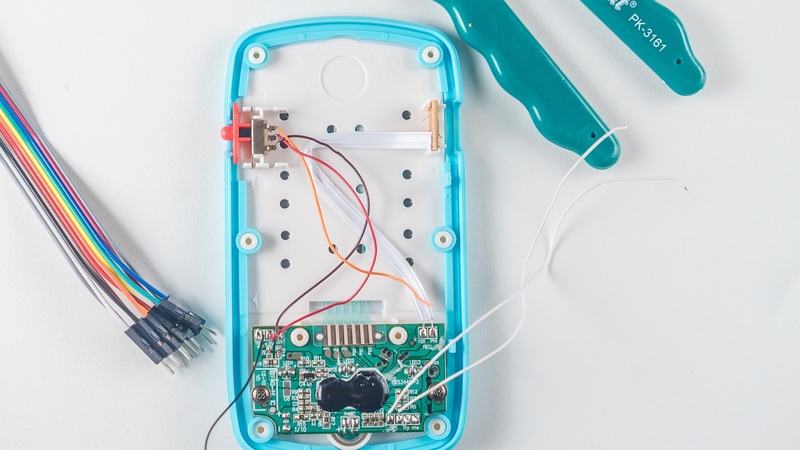 A simple toy phone was taken apart, and controlled via Teensy and USB-based MIDI. The battery pack was disconnected. The toy was powered by the Teensy instead of batteries. 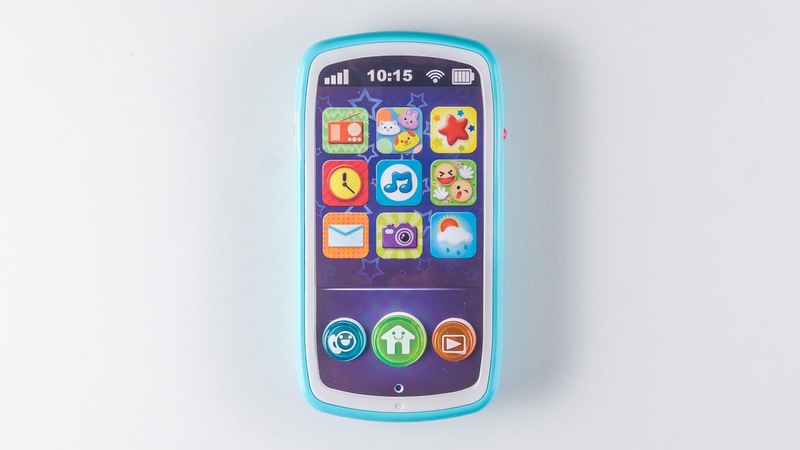 This is the toy featured in this example. Of particular interest was the camera click sound for the camera button. 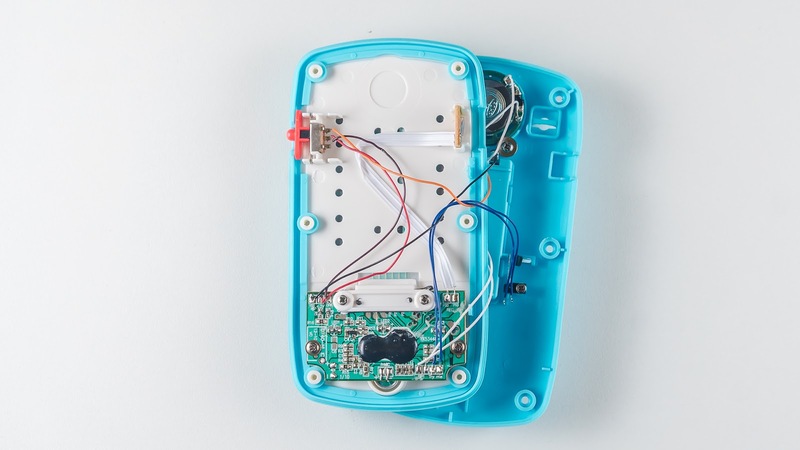 The toy is opened up, and the circuit board is visually and functionally explored. 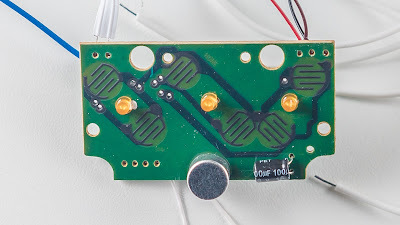 This is the close up of the circuit board. Functionally, there are a number of points of interest, labelled A to J in the image. 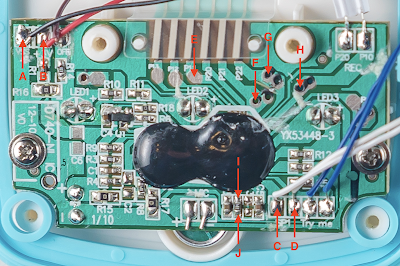 Of note is that the main matrix of nine buttons (on the front face of the toy) are connected to the chip via nine pins. 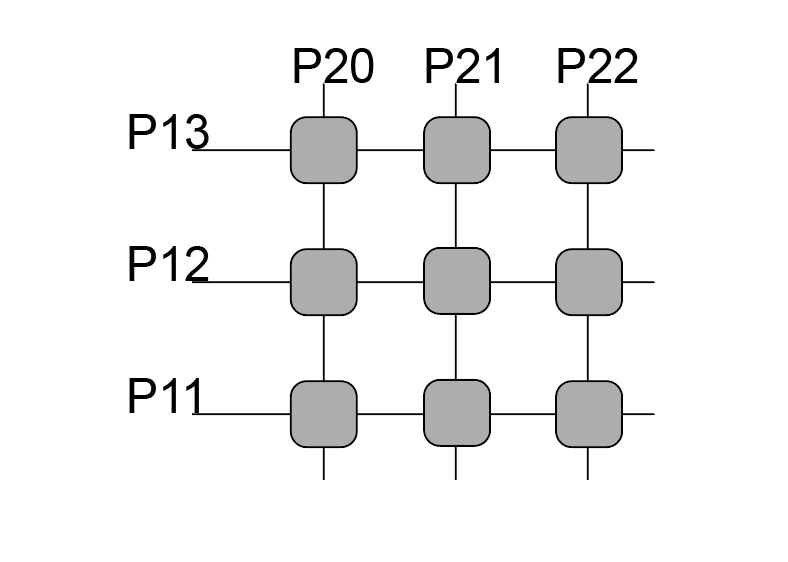 Three pins (labelled on the circuit board as P13, P12 and P11) represent the rows, and another three pins (labelled on the circuit board as P20, P21, P22) represent the columns. When a row pin and a column pin are connected (by pressing a key, for example), then a sound is triggered. 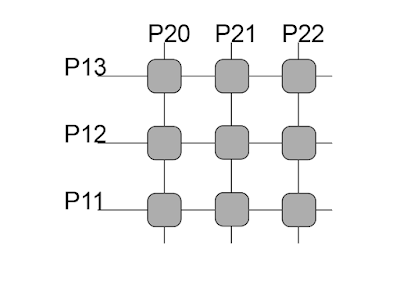 Three pins are set as inputs, the other three as outputs. The software can set two outputs low and one output high (for instance, column 1 high, column 2 low, column 3 low) and then measure on the other three pins (therefore row 1, row 2, and row 3). If a given row is measured as high, then the combination of the current column and the measured row indicates which button is pressed. This process is repeated for all three columns. By connecting Point E from the previous image to Points G or H, this is making these column to row connections - and as a result, triggering the sound. 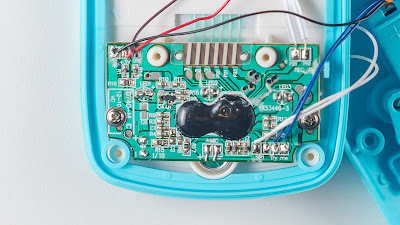 The speaker and batteries are removed. A set of six wires are prepared. 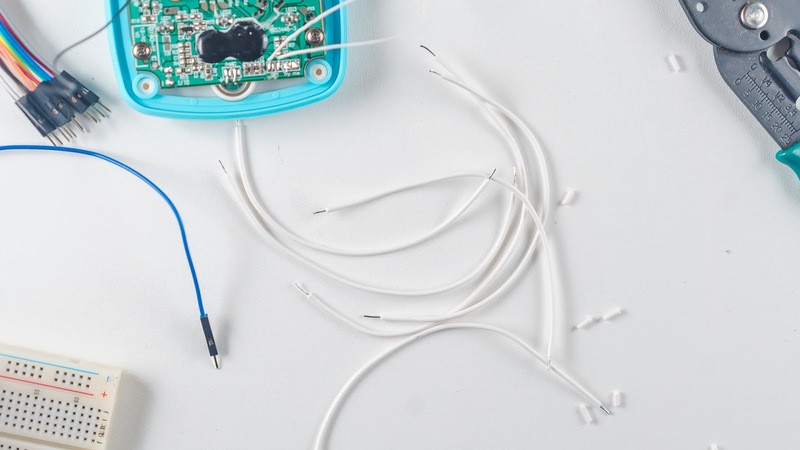 The end of each wire is stripped back a little, and a small amount of solder is added to each end of the wire. These six wires will be soldered to points E, F, G, H, I and J so that the connections for the button pressing and pitch bend can be made to a breadboard. This is the underside of the circuit board. 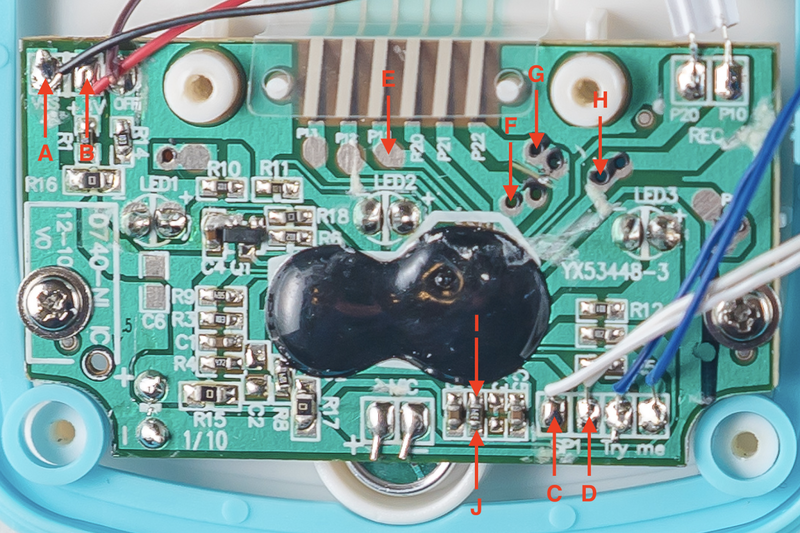 Conveniently, points F, G and H are all through-hole connections, with a small copper area perfect for soldering on the front side. 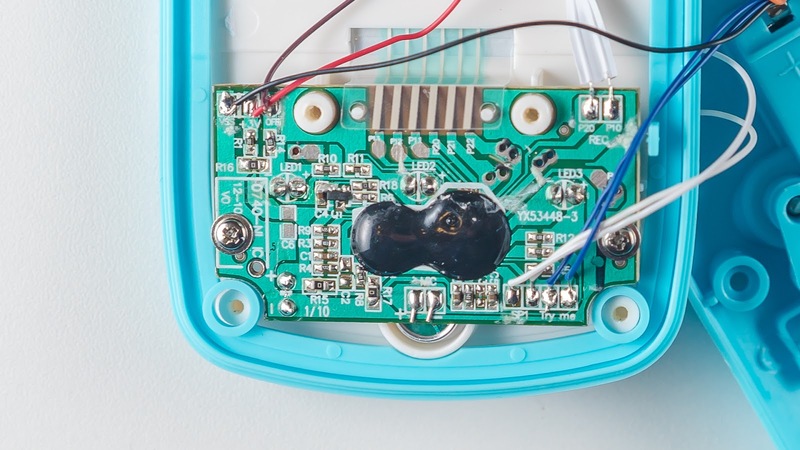 The wires can be sent through the holes from the underside, and then soldered to the front side easily. The toy is now completely removed from the casing. The black wire is ground, the red wire is 3V, the the white wires to the bottom of the board are the speaker connections. Four wires are soldered to points E, F, G and H. These will be connected to a multiplexer, so as to replace three of the buttons. In the case of point E, the copper surface had to be scratched back using a screwdriver - this made it possible to attach solder and hence the wire to it. The clock resistor is desoldered. One wire is soldered to point I, another wire is soldered to point J. In both cases, a small amount of additional solder onto the circuit board made it easier to connect the wire to the circuit board. The toy is connected to a breadboard. 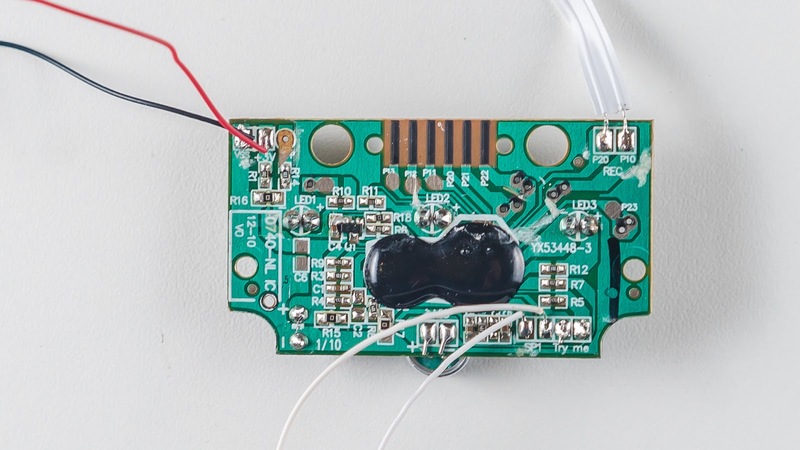 The speaker outputs are connected to a digital pot. The key connections are connected to a multiplexer. 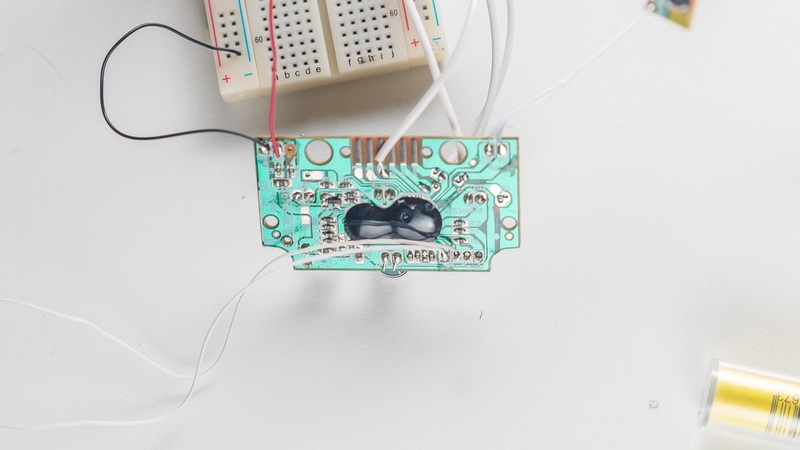 The power supply terminals are connected to the 3V supply of the Teensy. 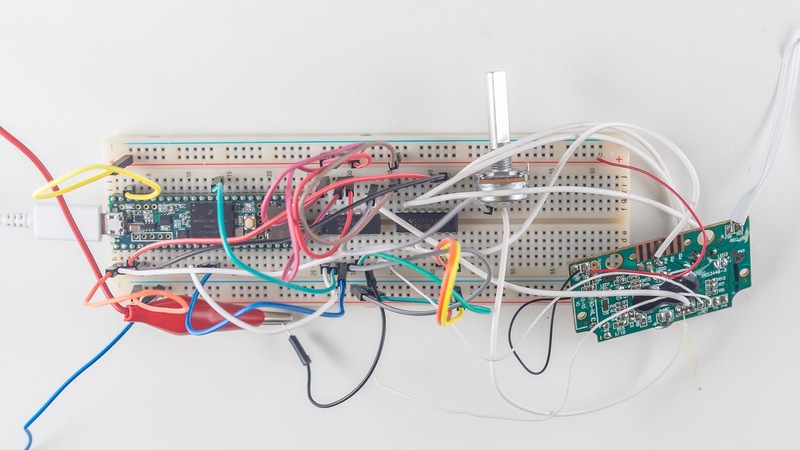 The Teensy 3.6, 4051 multiplexer and MCP4241 digital pot are all placed on the breadboard. This is the code used to control the toy. 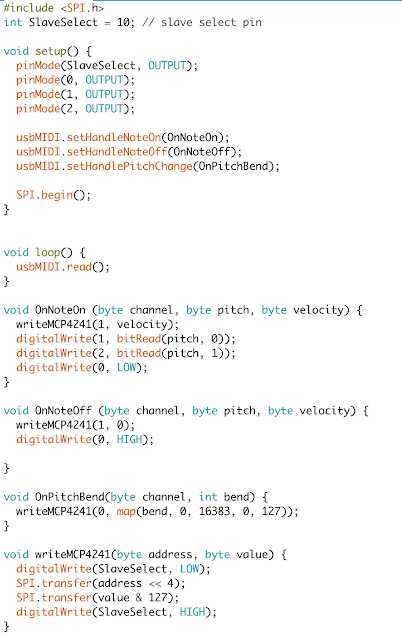 The code responds to MIDI data. Different pitches will trigger different buttons (out of the three connected buttons). Pitch bend will control the playback rate of the sound. Velocity will control the volume. The SPI library is included and a slave select pin is defined. In the setup function, the slave select pin, and pins used for the 4051 are set as outputs. Handlers are set for note data and pitch bend data. The SPI bus is started. In the loop function, the USB MIDI bus is read. 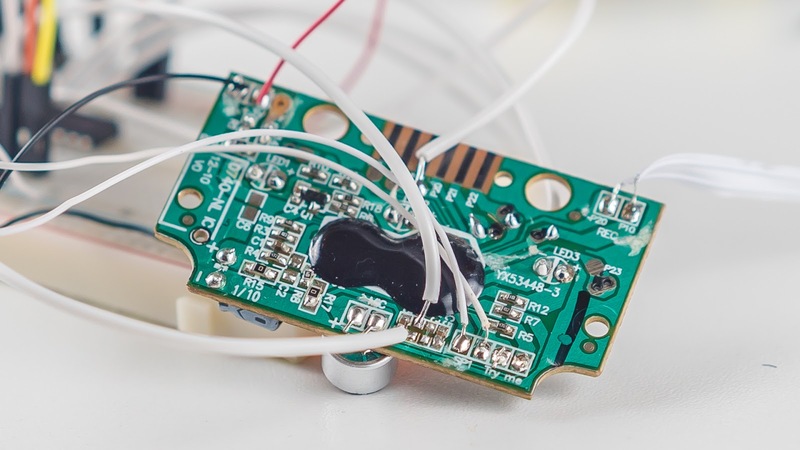 The function that is executed when a note on message is received sets the volume digital pot based on the velocity, selects the appropriate button via the two address bits of the 4051, and sets enable to on for the 4051. This triggers a button, at a pitch, with a certain volume. The function that is executed when a note off message is received sets the volume to zero, and sets the enable to off for the 4051. The final function is an encapsulation that writes data to the MCP4241.